Vestibular disorders can create an overlooked stumbling block. As elder care providers, you’ve surely heard that accidental falls are a leading cause of death among older adults, killing an estimated 13,000 elders in the United States each year and resulting in more than 1.5 million visits to hospital emergency departments. In March 2008, the Centers for Disease Control and Prevention (CDC) reported that more than $19 billion is spent annually on treating elders for the adverse effects of falls and that the mortality rate from falls among older Americans has increased 39% between 1999 and 2005. But aspects of these statistics of which you may not be aware are the varied and often overlooked causes behind the falls, including illnesses, medications, and undiagnosed vestibular (inner ear balance) dysfunction. In fact, a recent Johns Hopkins study found that broad-based demographic studies consistently show vestibular disorders in older adults are underdiagnosed and undertreated. According to the Johns Hopkins study, one third of American adults, or 69 million men and women over the age of 40, are up to 12 times more likely to sustain serious falls due to some form of inner ear dysfunction that undermines the sense of balance and causes dizziness. Among the other key findings of the three-year survey and study on the subject is that one third of this group, or more than 22 million, were unaware of their vulnerability, having had no previous incidents of disequilibrium or sudden falls to suggest that anything was physically wrong. Lead study investigator Yuri Agrawal, MD, says one reason for the large number of undiagnosed and untreated individuals is the lack of balance testing, which requires specialized training and tests that take more time and effort to perform than other diagnostic or screening procedures. “Tests for the inner ear are not common and are often difficult. Typically, patients would complain of dizziness to their primary physician only to be sent to an ENT [ear, nose, and throat] or vestibular specialist. But through this study, we’ve uncovered a simple test that’s quick and easy and can be used in the doctor’s office,” she says. More than 5,000 people over the age of 40 participated in the survey that involved specialized exams and balance testing to determine who had vestibular dysfunction, identify its early signs and symptoms, and rule out such dysfunction among those who did not display the signs and symptoms. Participants were subjected to a half-dozen key tests of unsteadiness, including physical exams. Evaluators assessed balance function by determining subjects’ ability to stand upright with and without visual cues, including attempting to stand upright while wearing a blindfold or with their eyes closed or by not using their arms to maintain balance while standing on a foam-padded mat. “It's tests as simple as these that can help general practitioners get a better idea of what's going on with their patient," says Agrawal. Results of these tests show that the chance of having a balance problem increases with age and with the presence of diabetes. Eighty-five percent of men and women over the age of 80 had imbalance problems, or 23 times more than individuals in their 40s. And those with diabetes were 70% more likely to suffer from vestibular problems. Researchers say this is likely due to damage done by high blood sugar levels to the hair cells in the inner ear that facilitate balance control and to the long-term damage from diabetes to the inner ear’s small blood vessels. Caregivers educating themselves on this topic recognize that understanding the connection between falls and the vestibular system is the first step in diagnosing the problem. The Vestibular Disorders Association, an organization that serves individuals with vestibular disorders by providing information, offering a support network, and elevating awareness of the challenges associated with these disorders, explains that the ability to maintain balance depends on information the brain receives from three different sources: the eyes, the muscles and joints, and the vestibular organs in the inner ear. All three sources send information in the form of nerve impulses from sensory receptors to the brain. And while the vestibular system is a complex structure, there are a number of organizations dedicated to sharing information on its function and dysfunction, which can ultimately lead to falls. In June 2007, Medicare implemented its Physician Quality Reporting Initiative (PQRI), which encourages physicians to utilize more preventive strategies when working with patients experiencing a health problem, including falls. In fact, the organization recommends that physicians ask their patients three questions: Have you fallen more than once in the last 12 months? Have you fallen and been injured in the last 12 months? Are you fearful of falling? 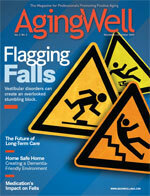 Medicare’s PQRI isn’t the only recognition given to patients experiencing falls. In response to the alarming trends in injuries from falls, then-president George W. Bush signed into law the Safety of Seniors Act of 2008. This law amends the Public Health Service Act to authorize the secretary of Health and Human Services to oversee and support a national education campaign focusing on reducing falls among older adults and preventing repeat falls and to award grants, contracts, or cooperative agreements to design and carry out local education campaigns. One organization committed to the Safety of Seniors Act is the Illinois-based Fall Prevention Clinics of America. Dedicated to the diagnosis and treatment of dizziness and balance disorders for individuals of all ages, the center utilizes the American Geriatrics Society 2006 practice guidelines, Medicare’s PQRI, and its Balance Correction Training program to achieve a success rate in excess of 87% at improving balance capability and relieving the effects of vertigo among all age groups. And since 2003, the clinic has been a referral resource for physicians, nurses, social workers, case managers, and physical and occupational therapists. It has also provided educational and consultative seminars to clinical and nonclinical staff at hospitals, nursing homes, assisted and independent senior living communities, and home health agencies. In a published paper, Bearce describes the vestibular system as the part of the inner ear that works with the eyes, ears, and muscles to send instantaneous information to the brain about an individual’s body position. “For instance, if you step on an uneven surface, your vestibular system immediately senses the shift in body weight, sends a message to your brain, and helps you compensate to avoid falling,” he explains. “All of this happens in a split second. Bearce also explains that inactivity causes the vestibular system to weaken, much like a muscle that isn’t used. Over time, the muscles and inner ear equilibrium don’t work in harmony because they are out of practice. Fall Prevention Clinics of America analyzes such a deficiency through vestibular testing, a three-step diagnostic process using computerized diagnostic equipment to test how the eyes, ears, muscles, and brain are working together. Once the weaknesses are identified, says Bearce, balance correction treatments can be prescribed to strengthen, retrain, or compensate for balance problems. Research results are positive, showing treatments to be successful 87% of the time. And while these activities are more physical, there are exercises for individuals who are less active. “This is where caregivers really come into play,” says Bearce. “They can help patients do ankle writing by resting one leg on an ottoman while using the tip of the toe on the opposite leg as a pencil to write the alphabet. We acquire good sensory input from our feet and ankles. By strengthening them, we can prepare for uneasiness in terrain. Caregivers can also play catch with a lightweight ball to help patients with hand-eye coordination. Start while seated and, as patients get better, have them stand up to play,” he says. Agrawal hopes that by identifying the magnitude of balance problems, primary care physicians will be more likely to be on the lookout for early signs and symptoms and more attuned to patients’ needs to be referred to physical therapists. For her team, Agrawal says the next steps are to evaluate screening tools for identifying as early as possible which older adults are at a heightened risk of falling. She says other risk factors, such as sleep patterns and nutrient deficiencies that may play a role in predicting risk of falling, also need further study. Various rehabilitation techniques should also be examined to pinpoint which work best in preventing falls and, ultimately, allowing people to live longer and healthier lives. The costs of fall-related injuries are often shown in terms of direct costs. Direct costs are what patients and insurance companies pay for treating fall-related injuries. These costs include fees for hospital and nursing home care, doctors and other professional services, rehabilitation, community-based services, medical equipment use, prescription drugs, changes made to the home, and insurance processing. In 2000, the total direct cost of all fall injuries for people aged 65 and older exceeded $19 billion: $200 million for fatal falls and $19 billion for nonfatal falls. By 2020, the annual direct and indirect cost of fall injuries is expected to reach $54.9 billion (in 2007 dollars). In a study of people aged 72 and older, the average healthcare cost of a fall injury totaled $19,440, which included hospital, nursing home, emergency department, and home healthcare but not physicians’ services.